The sound of croaking frogs last night was soothing after a day of listening to the roar of fast running water. The sound of rushing water fills me with dread. But once confronted by the creeks we just get on with the job of getting across otherwise it would be easy to be paralysed by fear. It was lovely to sleep by the lake. This morning when we woke it was absolutely silent. I love waking up in the Big Agnes Hilton, getting excited by the prospect of what the day ahead will bring. I love this as much as the end of each day when we curl up inside our sleeping bags, safe and warm. 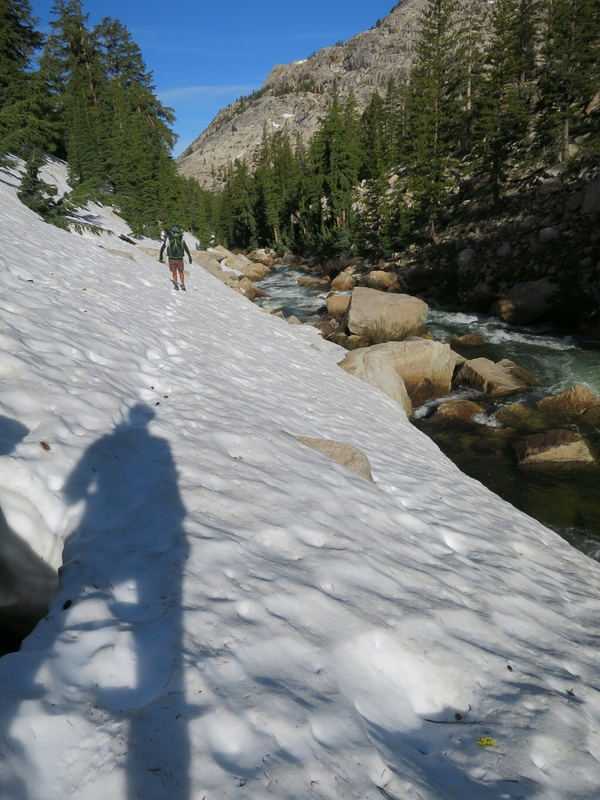 This mornings hiking started on icy snow alongside the roaring Rodriguez Creek. The slope and ice made for slow progress downhill. Lucky Hammer managed to fix our hiking poles so we can still use them. At the bottom of the canyon we were faced with a creek crossing. It was flowing swiftly and looked to be mid – thigh deep. I was being brave and went before Hammer. I put one foot in and before I could plant my second foot I was knocked over by the force of the flow. Even in my hiking shoes, the bottom was just too slippery. I fell in, but only got my arms and legs wet. 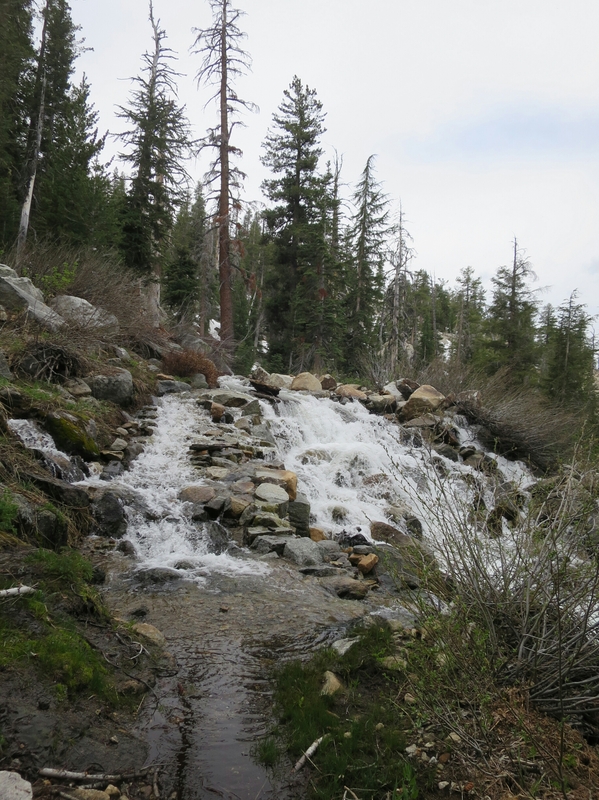 The creek was wide and the bed was made of smooth, rounded slippery rocks. We had to find another way to cross. I went upstream and Hammer went downstream to look for an alternative. Upstream was even worse, narrow and running way too fast. Downstream Hammer found a log across the creek. Only one problem, the log was really narrow especially on the other side. We had no other choice. It was this or we are stuck. Hammer went first. Halfway across he paused and started to wobble. My heart stopped, I could barely breathe. He managed to steady himself and make it to the other side. Then it was my turn. I moved ever so slowly, inching my way across. I got distracted by a length of rope caught on the log. Someone has crossed here before using rope to steady themselves. Thus momentarily distracted by concentration. I tried not to look at the rush of water underneath the log. But at the same time preparing myself for the shock if I should fall in. It seem to take eternity but I made the other side. I threw myself into the shoreline shrubbery, extremely shaken by the experience. It took us both sometime to regain our composure and get on our way. 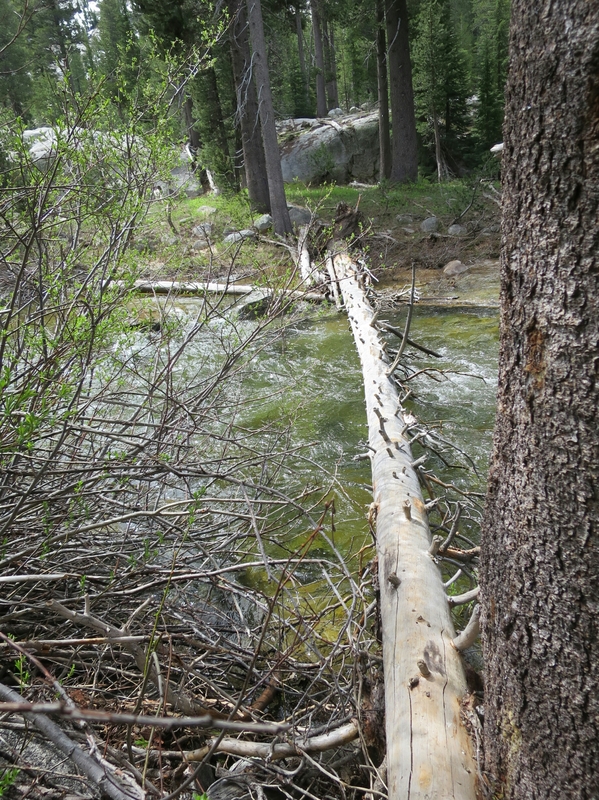 Luckily we did not have to bush bash to find the trail, it went right by the log crossing. From here we ascended possibly the most beautiful section of trail. 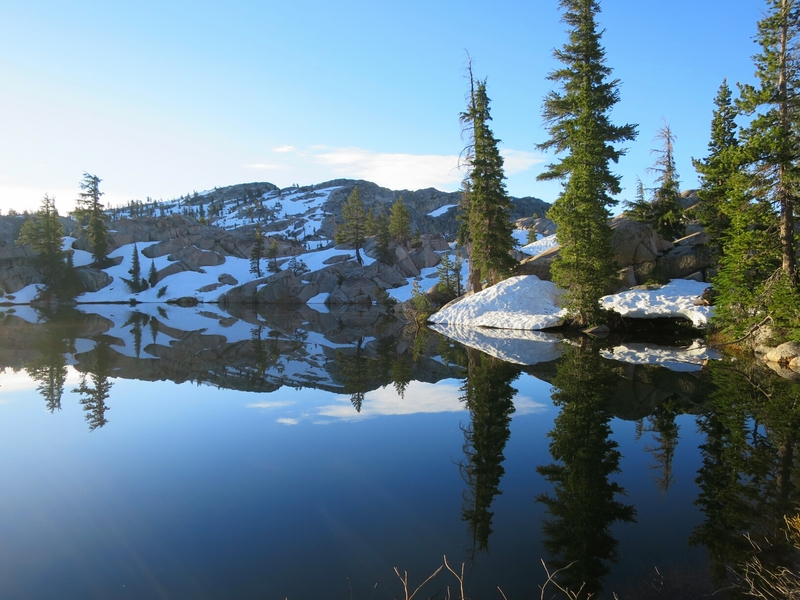 It was a brief snapshot of what the Sierra could be like in 5-6 weeks time or when the snow melt is all gone. The trail was dusty and dry any drainage channels have long dried up. 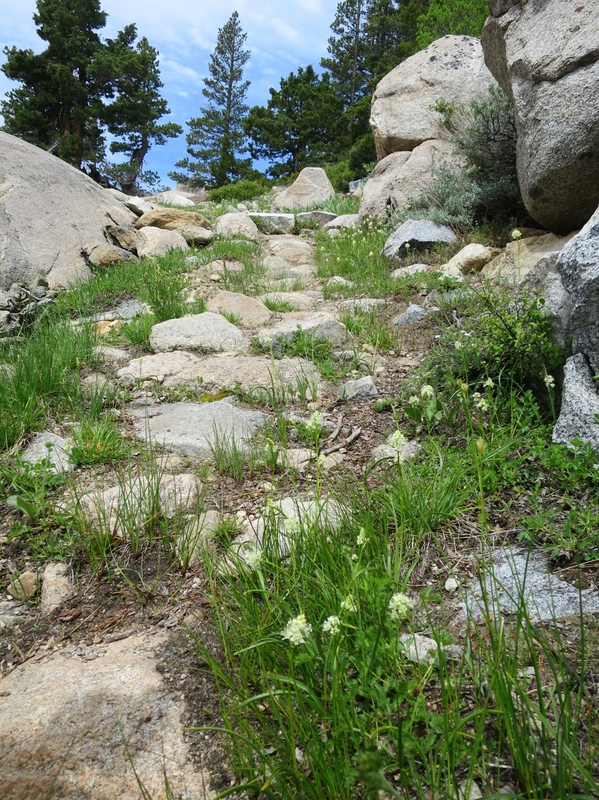 It was the first section of trail since we entered the Sierra mountains that had wildflowers in bloom. It was a lovely way to get over the difficulty of the last creek crossing. Over the summit we started to descend to a canyon. 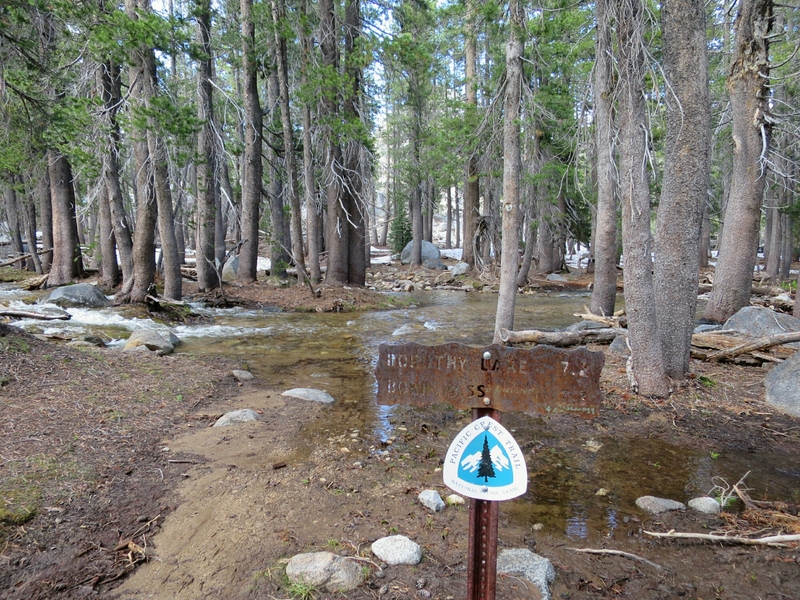 On the way down we had another ‘reliable seasonal creek’ to cross. This also turned out to be a heart stopper as it was made of multiple braided streams barreling downhill and converging over the trail. It took us a while to work out the safest way to cross. We managed to get across with much trepidation. Before reaching out campsite for the day we engrossed a further 2 canyons, Kerrick and Stubblefield, with a creek crossing at the bottom of both. 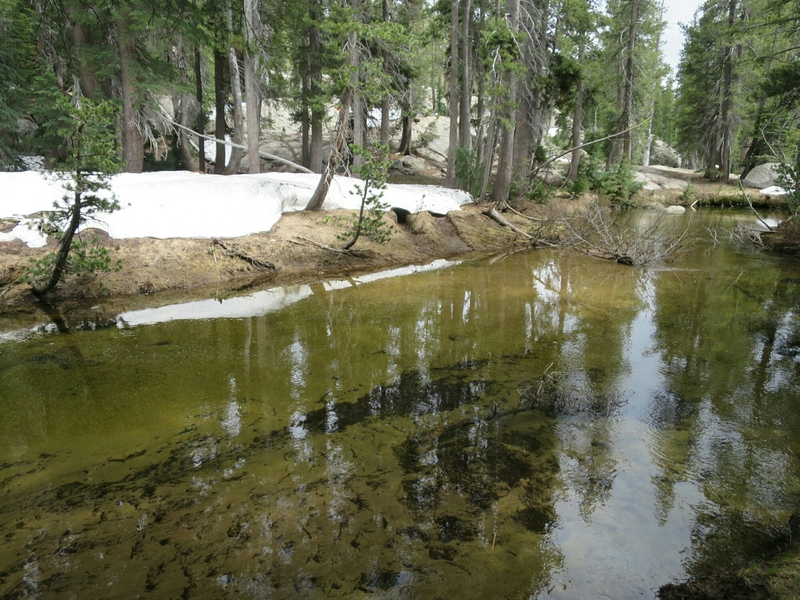 Both these creeks were wide and gentle flowing. We took our clothes off to cross here as the water was fairly deep. The sun was shining, the water was cold but not numbing. 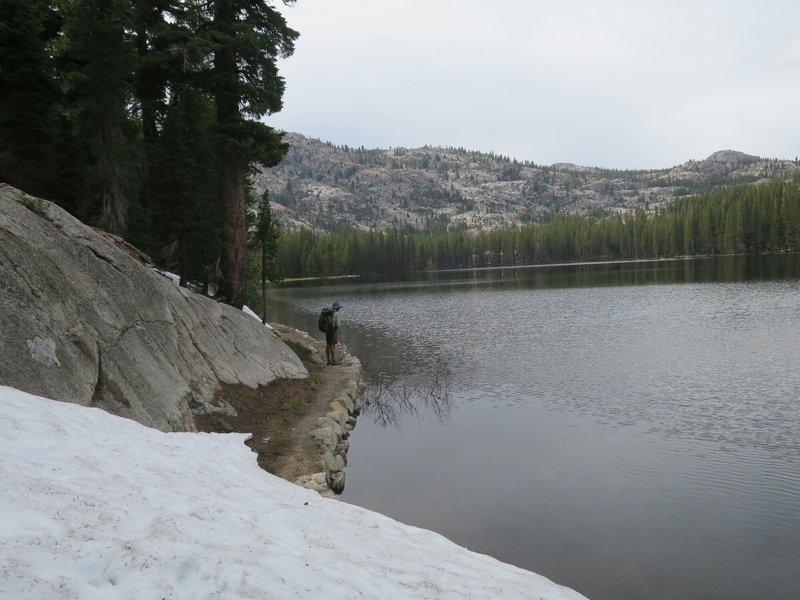 In addition to the canyons we also had to navigate the shore of Wilmer Lake where the trail was either under water or under snow. Navigation was difficult and we made a slow progress. 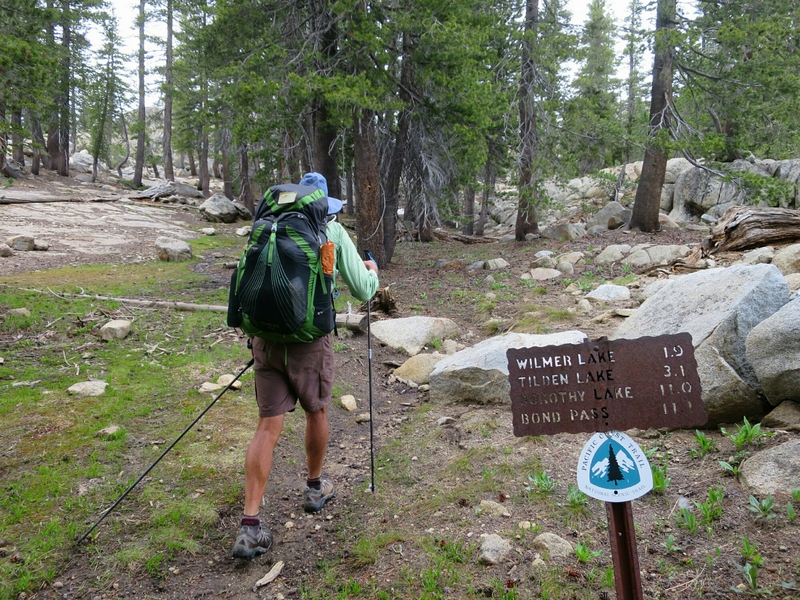 Hiking the PCT since we entered the Sierra Nevada Mountains has been like an obstacle course. 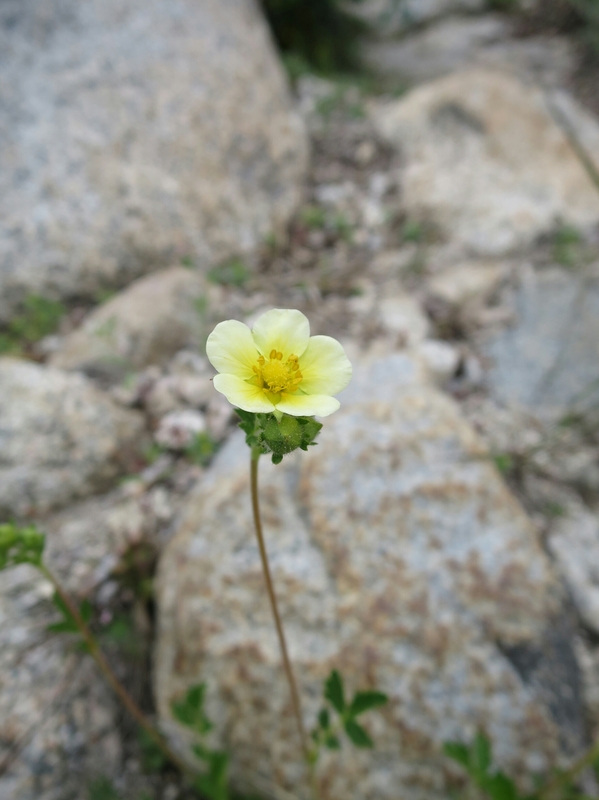 I thought that having made it over the high passes the worst of the obstacles was over. 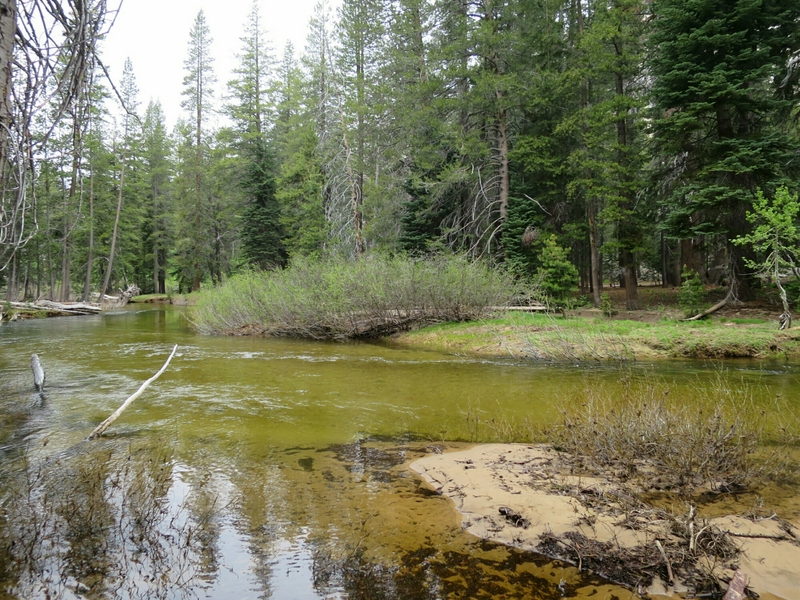 The creek crossings since Yosemite have been a far more challenging and frequent obstacle on our route north.